Passerby: What the hell? 'Scuse me. Who's watching these babies? Jay's Mother: Uh... the fat one's watchin the little one? Passerby: Oh yeah, nice parenting. Leave 'em out here like that and see what happens. Another appearance by the "Two packs of wraps" kids. A Chasing Amy in-joke in Holden's apartment. More of Banky and Hopper at the premiere; this scene reveals that Banky is gay and also includes the reappearance of Scott Mosier as the "tracer" guy from Chasing Amy. Q: What are the references to Kevin Smith's other work? Q: Is this the final movie set in 'The Askewniverse'? If you're the type of movie goer who gets uptight hearing countless F Bombs and explicit sexual discussion, then please move along and let others get in line to see one of the Funniest movies I have seen in my recent memory. "Jay and Silent Bob Strike Back" is a movie that has so much going on, that one screening is not enough for me to all that was thrown at me in 90 plus minutes. Writer/Director/Co-Star, Kevin Smith (Silent Bob) has without a doubt created if not his best movie, then it would have to be his funniest. A fitting conclusion to his "New Jersey Trilogy" (that now consists of five films instead of the originally planned three) forgoes the serious religious overtones of "Dogma" and the Sexuality issues brought forth in "Chasing Amy" to go for pure Laughs...............and it succeeds. The film's main plot revolves around the familiar duo of Jay (Jason Mewes) and his "Heterosexual Life mate" Silent Bob and their attempts to thwart a movie based on a comic book about Jay and Bob. It's essentially a road picture as the guys make their way from Leonardo, New Jersey to Hollywood. Along the way they meet international Jewel Thieves, Steal a Monkey, Meet The Scooby Doo gang, Try and Beat up Ben Affleck and Matt Damon, and much more. As Silly as all this sounds it's done in such a way that's smart, witty, and still has a touch of class about it. And that's pretty hard to do considering I can't even tell you some of the content of the movie without being censored heavily. 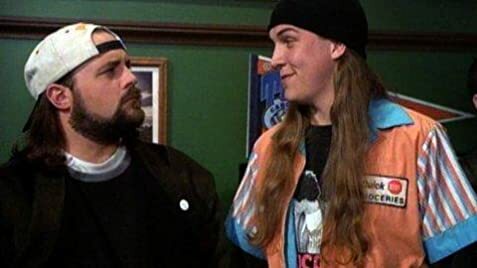 If you are at all familiar with Smith's movies (Clerks, Mallrats, Chasing Amy, and Dogma) you will get a kick out of the countless cameos and connections to his other films. For Example, Jason Lee reprises two roles (one from "Mallrats" and one from "Chasing Amy") as does Ben Affleck. Matt Damon appears as himself playing "Will Hunting" in a fictitious sequel to "Good Will Hunting" entitled `Good Will Hunting II: Hunting Season". There are two highlights of this movie that I need to talk about. First Being Jason Mewes as "Jay". 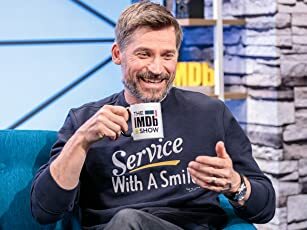 This guy is for real, by far and away he has put in the best performance of all his five film appearances as "Jay" He carries the picture and is side splittingly funny. It is my hope that he can now get other roles in movies besides the loveable Dope smoking "Jay". Secondly I want to address Kevin Smith's Directing. To all the people who say Smith can't direct need to see "Jay and Silent Bob". His use of motion should silence everyone who claims there are no moving shots in a Smith film!!! It's almost become fashionable to blast Smiths direction because that's the Thing to do. With all the great action and movement in "Jay and Silent Bob' Smith can finally shrug off all the criticisms of the past. What can I say to sum up? It's a brilliant movie for everyone, not just Smith fans. You will laugh and laugh some more. Do yourself a favour and go see it as soon as you can! 89 of 122 people found this review helpful. Was this review helpful to you?